Faculty of Nursing organized a Guest Lecture on 25th January, 2017 on Analytical Skills. The Chief Guest Mr. Praan Kumar Kaul, Senior Lecturer at Royal University of Bhutan has been invited for this function. The program has been started with the lighting of the lamp by the Chief Guest & the dignitaries of SGT University. The lecture has been delivered in the sequence of various contents like description of the brain system & its functions. Specifically he explained regarding about left brain has functions of logical, systematic, sequential, analytical thinking which composed of vertical thinking & vice versa in right brain has functions of randomly, synthesizing which composed of lateral thinking. In this he added about the description of words which is written in different colors & how the brain has perceived and reflected. Nextly he gave puzzle about the four persons crossing the bridge within stipulated time like 17 mts with the help of 1 torch & it has been beautifully solved by the students. Lastly he discussed about the importance of saving lives of humans who travelled in the ship. It has been really interesting, enthusiastic & awesome lecture. 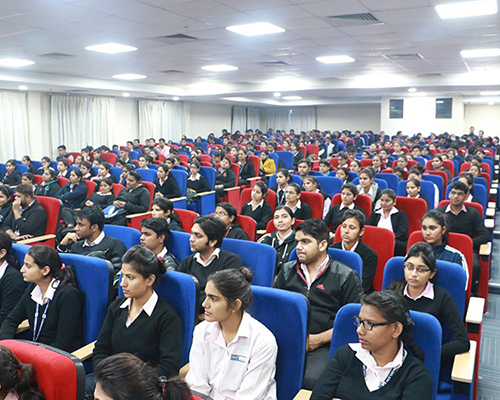 Students & the Faculty enjoyed the session absolutely. The program has been ended up with the Vote of Thanks.